It surprises people to learn that technically there isn’t much difference between creme caramel, pots de creme, and creme brulee. The rich custard is the same, it is the topping that is different. 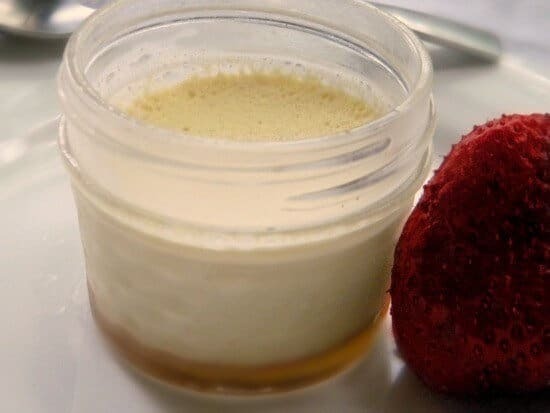 The custard is impossibly rich and creamy because it is baked in a water bath, and covered so the ingredients cook very slowly and with plenty of moisture from the steam that is locked in to the container. To achieve that rich, perfectly smooth, buttery texture you have to be careful not to over cook the dessert. I like to use the small, wide mouthed jelly jars – 4 ounces I think. They are a perfect one serving size, have covers, are inexpensive, and I have a lot of them because I used to can a lot. There are also custard cups that you can buy that are made especially for pots de creme, creme caramel, and creme brulee. Don’t whip your ingredients – you don’t want to much air into the ingredients. 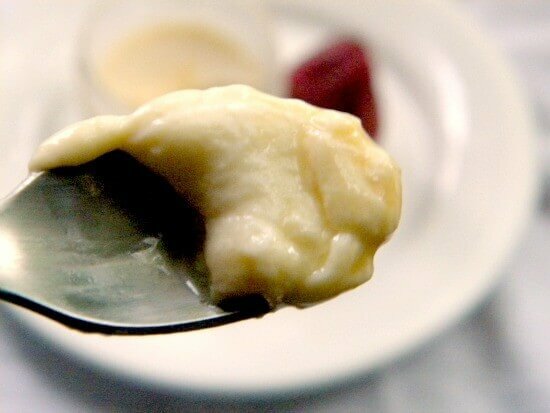 By stirring slowly and carefully you will be able to achieve that dense, creamy texture that is so incredible. Creme Caramel has a caramel sauce in the bottom so that when the custard is unmolded (if it is unmolded) the caramel flows down the sides of the custards and puddles on the plate. Creme Brulee has a delicate, crispy layer of caramelized sugar on the top which the diner breaks through with his spoon. The sugar is sprinkled on the finished custard and caramelized with a torch. Pots de Creme is the foundation for the other two. It is the custard without the caramel sauce on bottom or the crispy brulee on top. So, once you have the technique down for making one of them you will be able to make any of them. Then you get to experiment with flavors! Here is a classic creme caramel that is straightforward, rich, and delicious. 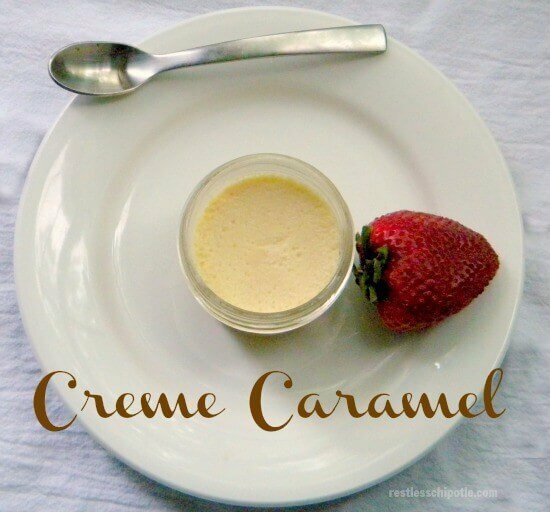 Once you know how to make a creme de caramel you can make creme brulee as well as pots de creme. Learn the technique for this luxurious but easy recipe and you'll be able to make any of the three. Put sugar and water in a saucepan over low heat. Increase the heat and boil until the sugar begins to turn golden brown. Quickly pour the hot caramel into 6 4 ounce jars. In another pan scald the milk and cream. Bubbles will form around the edge but don't let it boil. Mix the egg yolks, sugar, and vanilla until smooth and blended. Don't whip air into the mixture. Carefully whisk a few tablespoons of the hot milk mixture into the egg to temper it and then whisk in the rest of the hot milk. Remember, don't whisk so hard that bubbles form. Pour the mixture through a strainer into a clean bowl. This will catch and clumps of egg that might have formed. Lay a tea towel in the bottom of a 13 x 9 inch pan. Place the jars on the towel. Pour the custard mixture into each jar. Add boiling water until it comes a little over halfway up the jars, being careful not to get water in the custard. Cover the 13 x 9 inch pan tightly with aluminum foil. Bake at 325F for 35 minutes or until custards are almost set. Carefully remove the custards from the water and allow them to cool for about 10 minutes. Cover and refrigerate until thoroughly chilled - about 3 hours. To serve you can either serve it in the cup or remove it by dipping the cup in hot water, running a knife around the side, and inverting the custard onto a plate.